A scientist with the Canadian Museum of Nature has answered a long-standing mystery about why fossils of ankylosaurs—the "armoured tanks" of the dinosaur world—are mainly found belly-side up. In doing so, he has ruled out three other competing theories involving clumsiness, predation, and the effects of bloating as seen in armadillo roadkills. Palaeontologist Dr. Jordan Mallon says the evidence points to a phenomenon called "bloat-and-float", whereby the bloating carcasses of ankylosaurs would end up in a river, flip belly-side up due to the weight of their heavy armour, and then float downstream. The remains would wash ashore, where decomposition and then fossilization would seal the dinosaur remains in their upside-down death pose. "Textbooks have touted that ankylosaur fossils are usually found upside down, but no one has gone back and checked the records to make sure that's the case," explains Mallon. The observations date from the 1930s. Indeed, the fossils of two star ankylosaurs described in 2017, Borealopelta from Alberta and Zuul from Montana, were found upside down. Mallon examined 32 ankylosaur fossils from Alberta (of which 26 were found belly up), photos of specimens, field notes, and other signs such as erosion of the exposed surface, sun bleaching, and the presence of lichens. The results are published in the online journal Palaeogeography, Palaeoclimatology, Palaeoecology. Collaborators included armadillo experts Drs. Colleen McDonough and Jim Loughry of Valdosta State University in Georgia, and Dr. Don Henderson, with Drumheller Alberta's Royal Tyrrell Museum of Palaeontology. Mallon ruled out three other theories before settling on "bloat-and-float" to explain the preponderance of the belly-up remains. "One idea was that ankylosaurs were simply clumsy, tripping over themselves or rolling down hills and ending up dying that way," he says. But since ankylosaurs existed for about 100 million years, clumsy habits would not fit with their apparent evolutionary success. Another theory was that ankylosaurs were prey for carnivores, such as hungry tyrannosaurids, which would flip the armoured dinosaurs onto their backs to get at the soft underbelly. "If this was true, we would expect to see signs of bite marks, especially on upside-down ones, but we saw marks on only one specimen," explains Mallon. 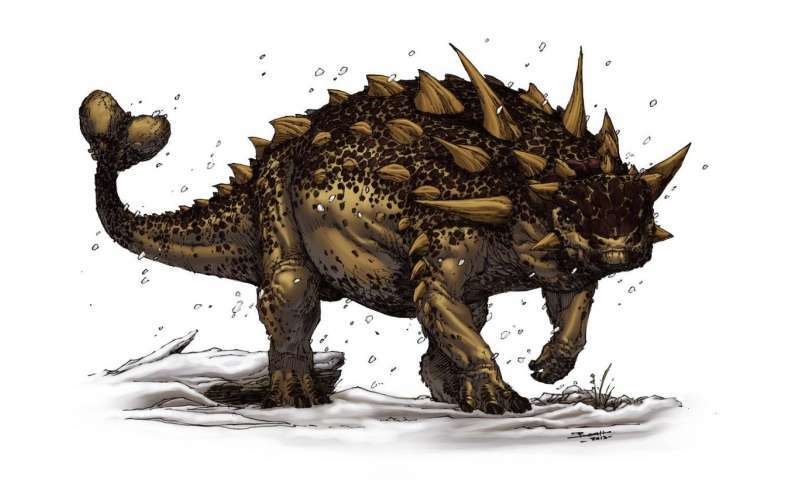 "Since they were armoured, it makes sense that ankylosaurs were not regularly preyed upon, and the fossil evidence in museum collections supports this." The challenge was to test this hypothesis. Enter McDonough and Loughry who are experts on modern armadillos, which also have an armoured shell. Over the summer of 2016, they studied 174 examples of dead armadillo. "Sure enough, the data show that they do not occur more often on their backs," says Mallon. The pair even examined dead armadillos placed in plexiglass cases in their backyard to keep away scavengers. Regardless of the positioning of the carcasses, bloating did not cause them to roll over onto their backs. That left the "bloat-and-float" hypothesis as the most likely explanation for the presence of upside-down fossils. To study this, Mallon turned to computer simulations developed by Dr. Don Henderson, who specializes in the floating behaviour of animals in water. Ankylosaur fossils in North America are found in river channel deposits, and in the Late Cretaceous Period these animals would have been living along a coastline of what is known as the Western Interior Seaway. "We designed these models of ankylosaurs, both clubless and clubbed, and looked at their floating behavior," explains Mallon. The computer modelling showed that the animals would tend to flip upside down quite easily in water. Nodosaurids, which are ankylosaurs with no tail clubs, would flip most easily at the slightest tilt; the ankyosaurids (with clubbed tails), were more stable but could still be flipped. "So 'bloat-and-float'" fits with their known environment, and this research helps inform about the transport behavior of dead dinosaurs, which is important to know when studying fossil ecosystems. Ultimately, this is a classic case study of the scientific method: examining alternative hypotheses, finding ways to test them, and ruling them out one-by-one. What you are left with at the end is the most likely explanation."